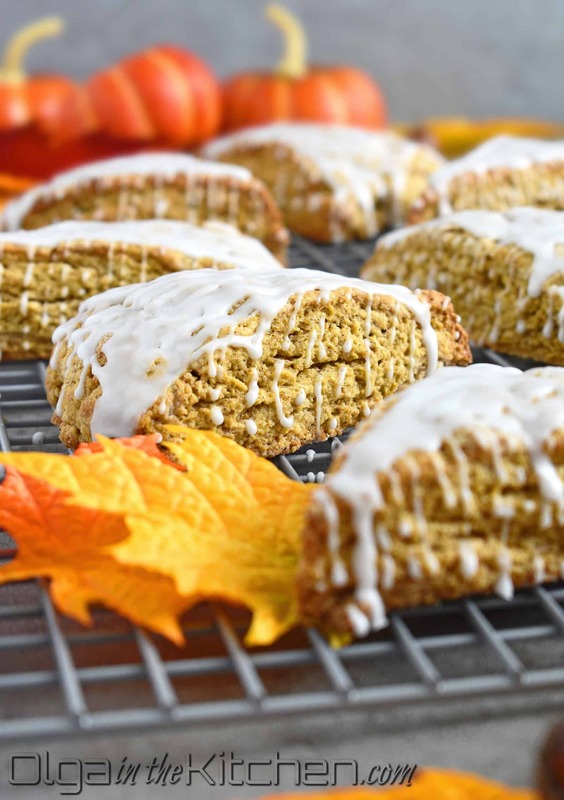 Pumpkin Scones: crumbly, crispy, moist on the inside and topped with delicious icing for the extra sweetness. The cinnamon, nutmeg, cloves and ginger spice the dough and the drizzled icing on top take their flavor over the top. Autumn is in the air!! I love a fresh warm scone early in the morning with my cup of coffee. It completes my breakfast. 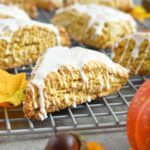 I have couple signature recipes for scones. I posted one of them few week ago, called Cranberry Scones. The difference between two is the dairy: sour cream or heavy cream. I change up the add-ins and flavors to create different variations. 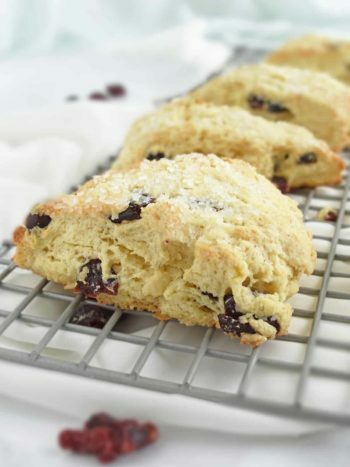 Scones are all about irresistibly crumbly edges and moistness of the dough on the inside. They must be crumbly! In order to get them crumbly, you must NOT overwork the dough and use all the liquid ingredients cold, from the refrigerator. 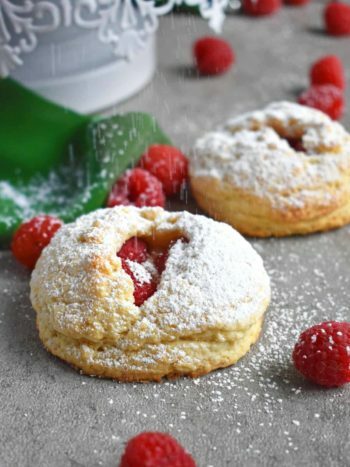 The dough of this recipe is not very sweet, but with the icing on the top, the combination is just the perfect amount of sweetness. There will be more scone recipes coming in near future as I had been experimenting with different flavors lately. 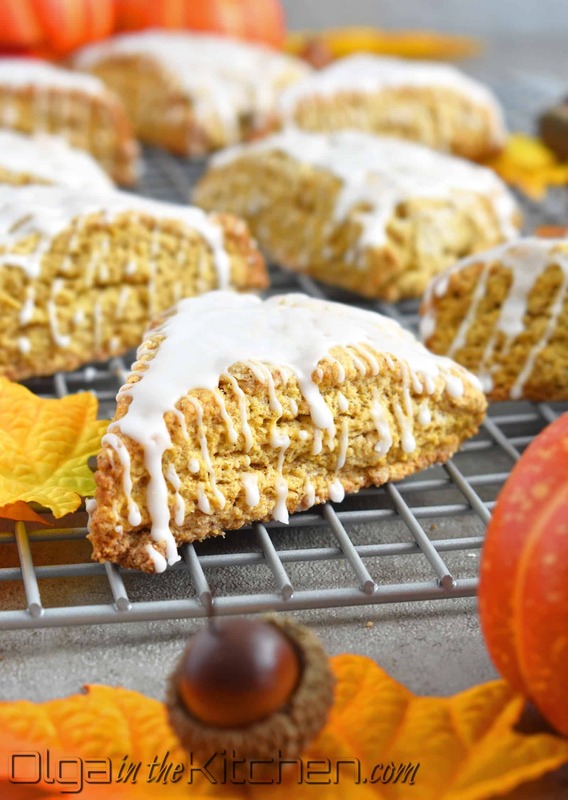 There can never be too much scones recipes. Homemade scones are nothing compared to the coffee shops. I remember our trip to Canada couple years ago. I ordered a scone at Starbucks and even reheated, it just tasted old and I could tell it had too much flour. Preheat the oven to a 400°F. Line a parchment paper with a baking sheet. 1. 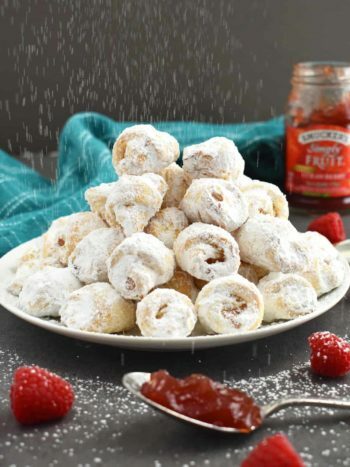 Line a sieve with a medium bowl, sift: 2 1/4 cups all-purpose flour, 1/4 cup granulated sugar, 1 tsp baking powder, 1/2 tsp baking soda, 1/2 tsp table salt, 1 tsp cinnamon, 1/2 tsp nutmeg, 1/4 tsp cloves and 1/4 tsp ginger. Add 1/4 cup brown sugar to the sifted dry ingredients (do not put brown sugar into the sieve; it won’t go through the tiny holes of sieve). Whisk with a fork to combine the dry ingredients. Grate 1 stick unsalted cold butter into the dry ingredients on the large holes of the grater. Work in the butter with a fork until the mixture resembles coarse meal. 2. 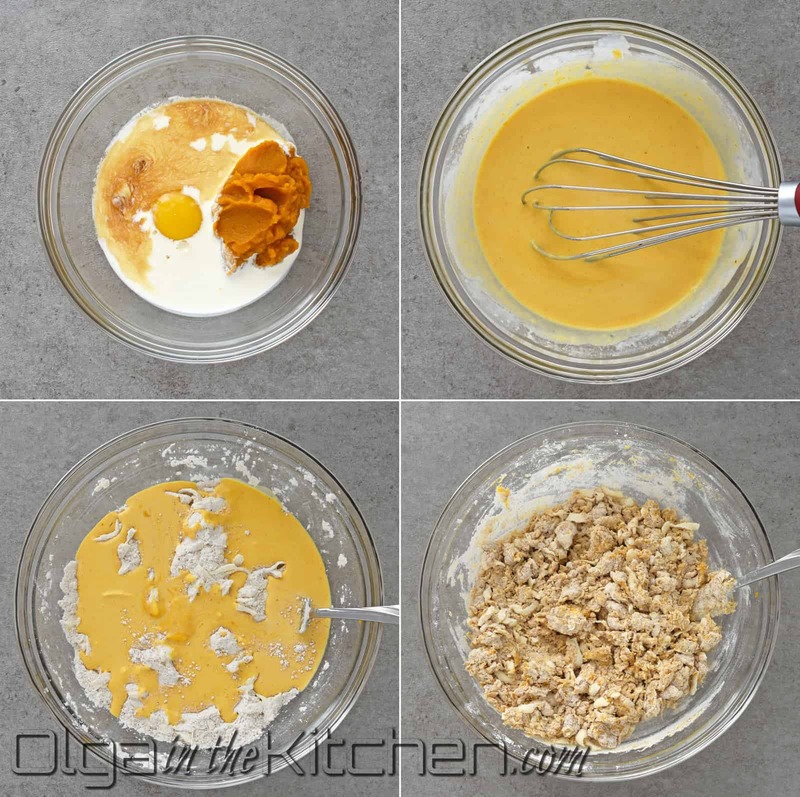 In a separate small mixing bowl or liquid measuring cup, combine and whisk 1/3 cup pumpkin puree, 1/4 cup heavy cream, 1 egg and 1/2 tsp vanilla extract. Add the liquid to the dry ingredients and stir with a fork until the dough starts to come together. 3. Using your hand, continue pressing the dough against the bowl into a ball. It would seem as there’s not enough liquid in the dough and you’ll see lose flour, but as you press, the dough will come together. 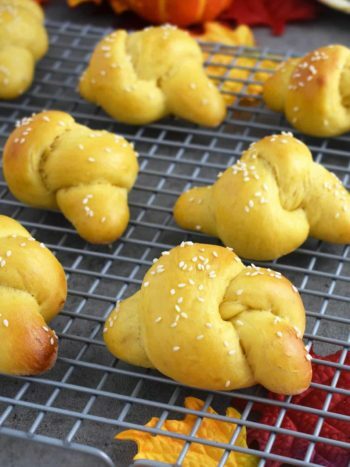 (Do not overwork the dough!) 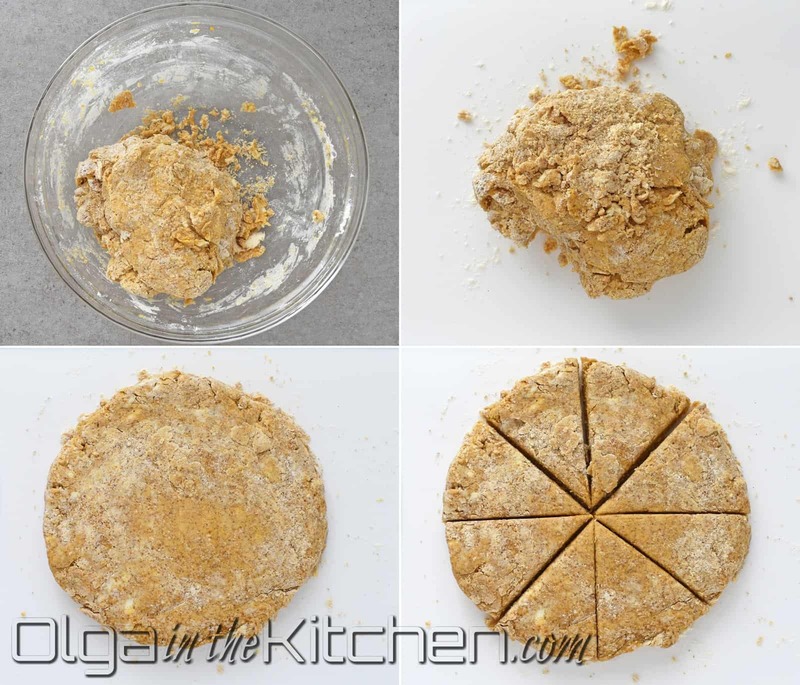 Transfer the dough onto a lightly floured surface and pat into a 7-8” circle about 3/4″ thick. Using a pastry cutter, cut dough into 8 triangles. 4. 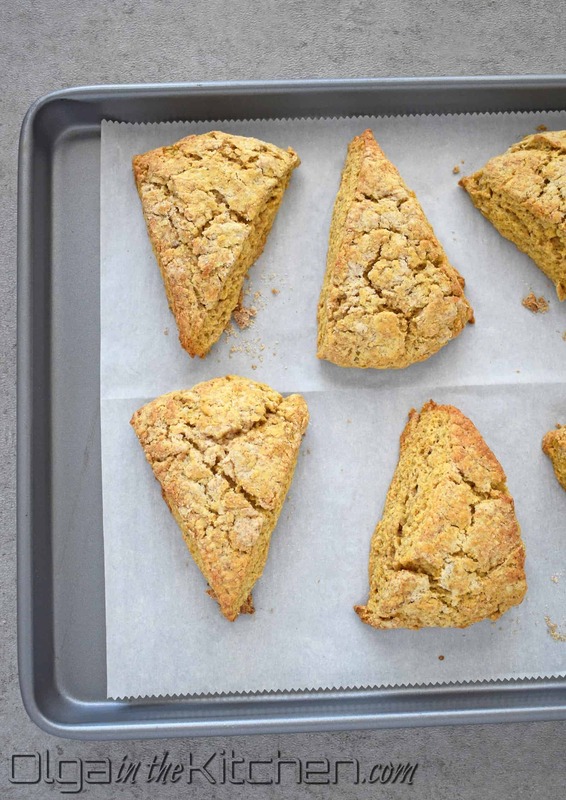 With help of a pastry scraper, carefully transfer scones onto a prepared baking sheet, 1-2” apart. 5. Bake for 15-18 mins until golden (I did 15). Transfer onto a cooling rack to slightly cool while you make the icing. 6. TO MAKE THE ICING: In a small bowl, combine and whisk 1 cup sifted powdered sugar and 1 1/2 tbsps milk. Mix until it becomes smooth. Transfer to a ziploc bag, cut off the tip of the bag 1-2 mm. Drizzle icing over the warm (not hot) scones. Serve warm and fresh with a cup of coffee and tea. Store them at room temperature covered with plastic food wrap. Reheat the next morning in the microwave for 15-20 seconds to enjoy them like-fresh again! 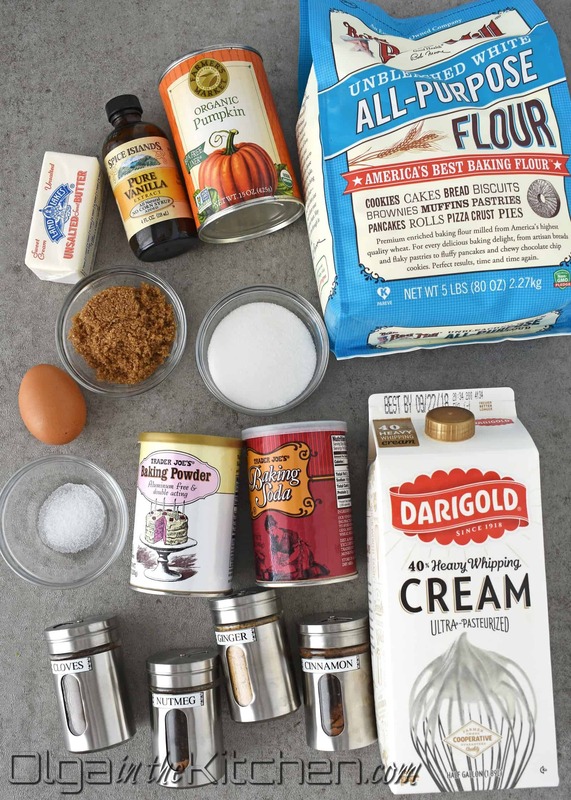 Line a sieve with a medium bowl, sift: 2 1/4 cups all-purpose flour, 1/4 cup granulated sugar, 1 tsp baking powder, 1/2 tsp baking soda, 1/2 tsp table salt, 1 tsp cinnamon, 1/2 tsp nutmeg, 1/4 tsp cloves and 1/4 tsp ginger. Add 1/4 cup brown sugar to the sifted dry ingredients (do not put brown sugar into the sieve; it won’t go through the tiny holes of sieve). 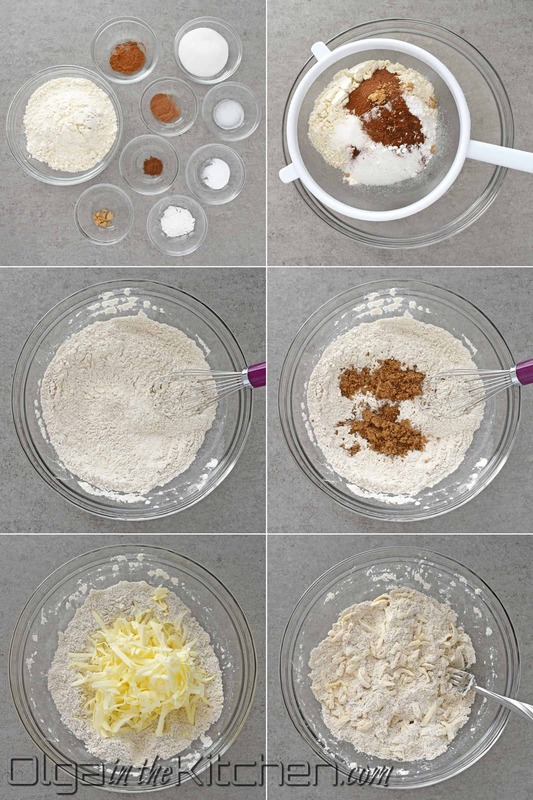 Whisk with a fork to combine the dry ingredients. Grate 1 stick unsalted cold butter into the dry ingredients on the large holes of the grater. Work in the butter with a fork until the mixture resembles coarse meal. 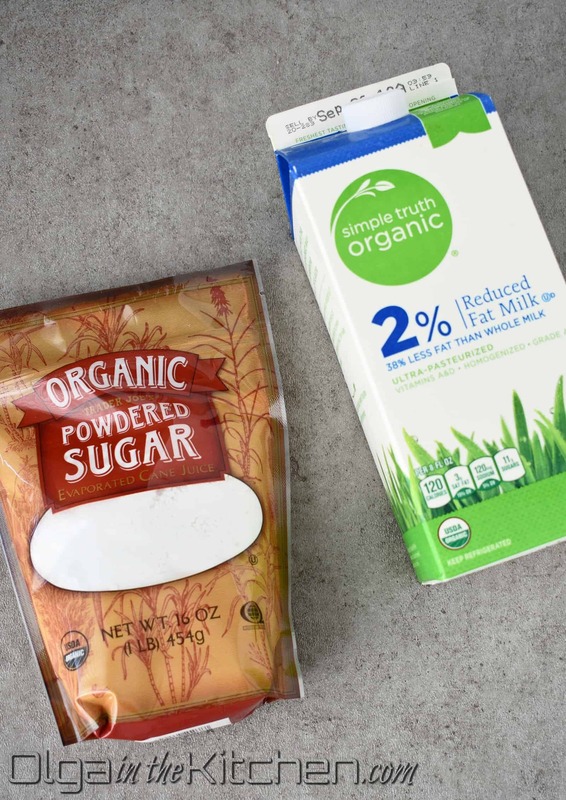 In a separate small mixing bowl or liquid measuring cup, combine and whisk 1/3 cup pumpkin puree, 1/4 cup heavy cream, 1 egg and 1/2 tsp vanilla extract. Add the liquid to the dry ingredients and stir with a fork until the dough starts to come together. Using your hand, continue pressing the dough against the bowl into a ball. It would seem as there’s not enough liquid in the dough and you’ll see lose flour, but as you press, the dough will come together. (Do not overwork the dough!) Transfer the dough onto a lightly floured surface and pat into a 7-8” circle about 3/4″ thick. 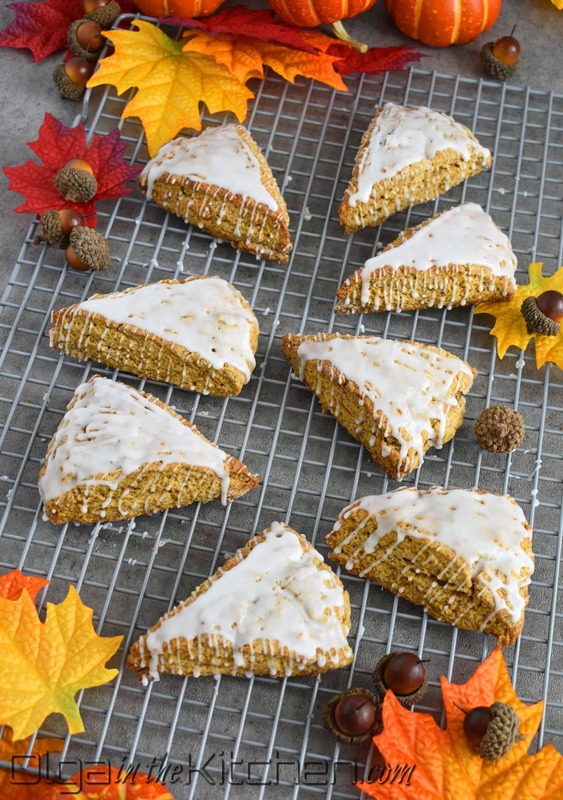 Using a pastry cutter, cut dough into 8 triangles. 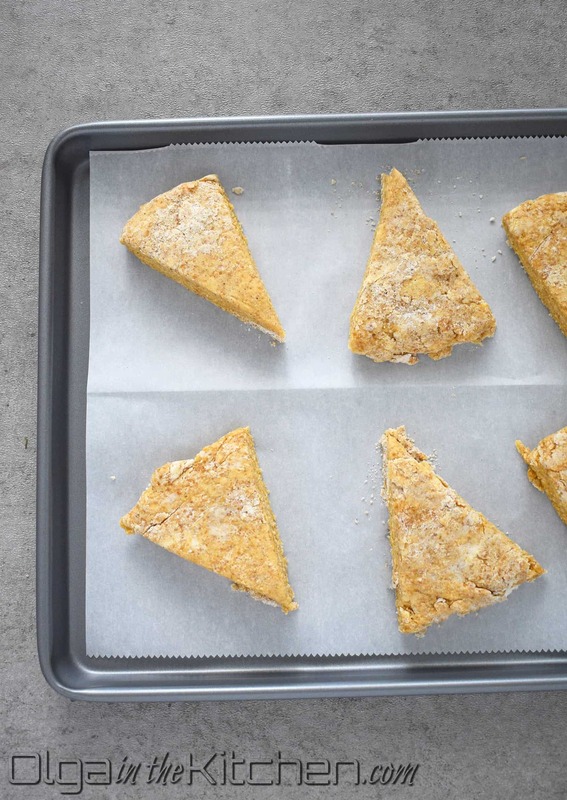 With help of a pastry scraper, carefully transfer scones onto a prepared baking sheet, 1-2” apart. Bake for 15-18 mins until golden (I did 15). Transfer onto a cooling rack to slightly cool while you make the icing. 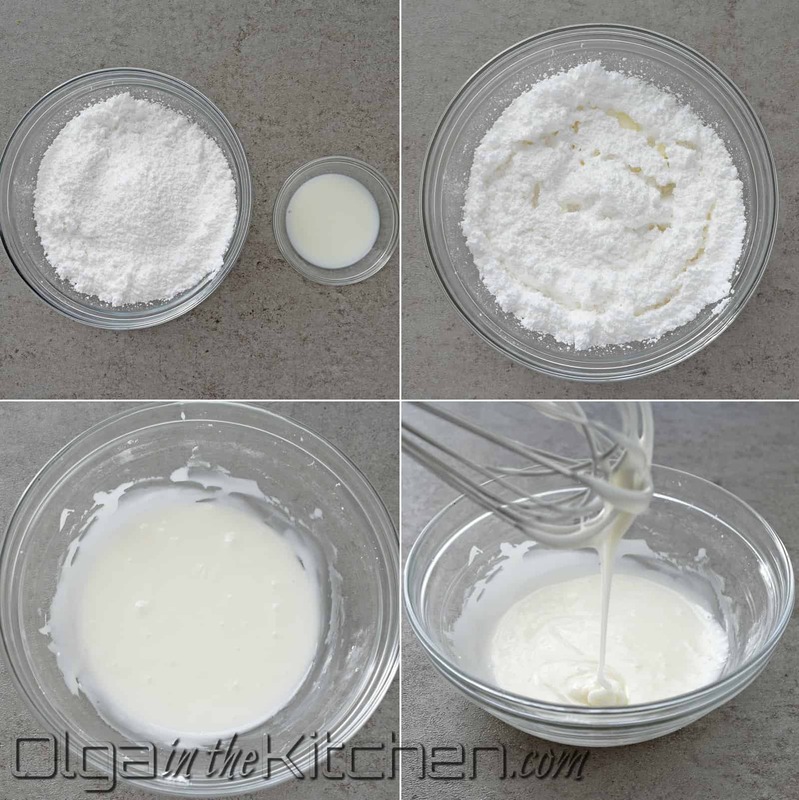 TO MAKE THE ICING: In a small bowl, combine and whisk 1 cup sifted powdered sugar and 1 1/2 tbsps milk. Mix until it becomes smooth. Transfer to a ziploc bag, cut off the tip of the bag 1-2 mm. 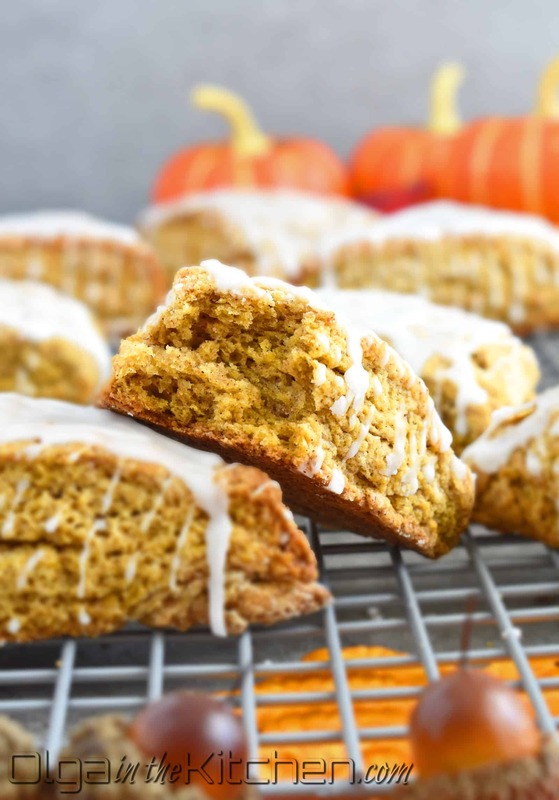 These are like the best pumpkin scones I’ve ever tasted. So flaky and moist at the same time, and the icing gives just the perfect amount of sweetness to these. I’m adding this recipe to my book! Thanks Beth 🙂 these are the best! !